Should I Consider a Professional Tooth Clean & Scale? Should I Consider a Professional Tooth Clean? This blog should really consist of one word – yes. But, we know that people need a bit more convincing that their routine of brushing and flossing isn’t enough to secure lifelong dental health. So, here are the reasons you should consider a professional tooth clean. Plaque is the cause of so many oral health problems, from cavities to gum disease and abscesses. This plaque produces an acid that wears away at tooth enamel and causes tooth decay and attacks gums. Plaque can be mineralised in our mouth and this becomes tartar, or calculus. Tartar is the unslightly yellow/brown stone-like deposits that sticks stubbornly onto your teeth. 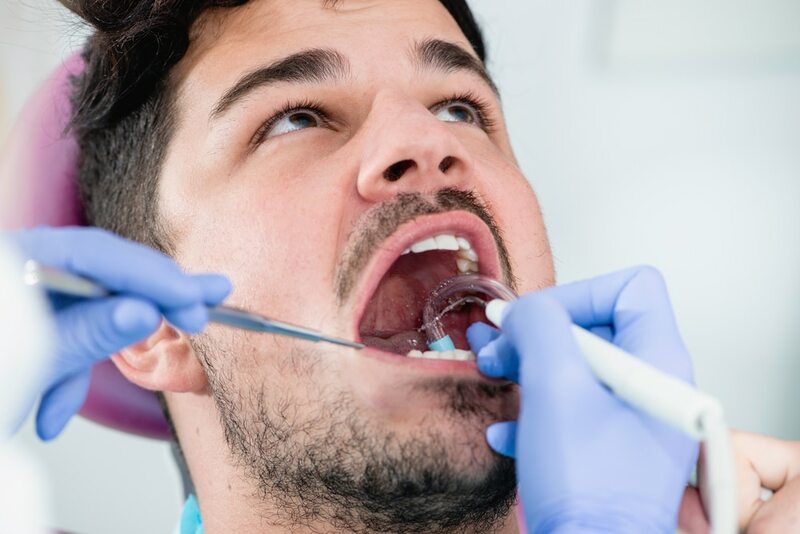 While plaque can be removed by brushing and flossing, only a professional clean can remove tartar and completely safeguard your mouth from decay. Decay and gum disease is the major cause of tooth loss. Gum disease especially can cause wide scale tooth loss as it destroys the jaw bone. This removes the anchor for the tooth of your teeth, meaning they loosen and eventually fall out. The best way to prevent this is by a good at-home regime coupled with regular professional cleans. A professional clean consists of two aspects – a scale and polish. A scale typically uses a professional ultrasonic tool to vibrate away all the unsightly tartar and the polish part uses state-of-the-art tools to buff your teeth which can remove built-up stains and leave you with smooth, freshly polished teeth. If you love your coffee, tea or red wine a regular professional clean will go a long way towards preventing those stains that rob your smile of its original aesthetics. Plaque is a sticky film clinging onto your teeth which attracts bacteria and food particles. As these particles rot, they create a foul odour, and sometimes that odour just can be removed by brushing, flossing or mouthwash. A professional clean will remove the plaque and any bacteria/particles and the final polish will make it harder for particles to attach to your teeth. The medical world is waking up to the link between oral and overall health. Professional cleans are an essential part of holistic dentistry because they are a preventative form of medicine. Not just in terms of preventing oral health issues, but in securing oral health which has been linked to decreased levels of health issues ranging from heart disease, to stroke, diabetes and even premature babies. Professional cleans coincide with your general check-up. This check-up also gives your dentist opportunity to check your mouth for signs of serious health concerns. The earlier they are found, the quicker and more effectively they can be treated. By preventing serious oral health problems you save yourself a lot of money. Replacing missing teeth, treating gum disease and getting restorative therapy for extensively decayed teeth is costly. There’s no two ways about it. By visiting your dentist twice a year for a check-up and professional clean, you can avoid all these problems. And, a lot of insurances will cover part of this cost! And if your private health insurance is with HCF or CBHS, at dhealth, your regular check up and clean might even be 100% free! So, How Does a Professional Clean Work? You should be convinced by now that a professional clean is necessary, but you may be worried about the process. Don’t worry, the entire process is carried out by a professional hygienist that are trained in cleaning and your dentist will know how to pick up on the signs of decay and stop it in its tracks. Perhaps the most important aspect of your professional clean appointment is the education. Your hygienist can look at your teeth and gums and see if you are brushing and flossing correctly and frequently. They can also tell if you have any bad habits like tooth grinding or clenching. Brushing and flossing the wrong way can be damaging. For example, brushing too hard can wear away enamel and lead to receding gums which promotes gum disease. On the other hand, brushing too softly won’t actually remove the plaque. Your hygienist can give you tips on finding that happy medium and ensuring your at-home regime is looking after your teeth in the same manner as a professional clean does.